RailRiders catalog is engineered to perform for men and women who demand great style, love adventure, and need to dress the part. Enter the coupon code - RRCC18 - at checkout on the Rail Riders website. Men's Outdoor Clothing - The guy who lives for adventure will appreciate the comfort good looks of RailRiders catalog shirts, pants and shorts. The clothing here is made of technical quick-dry fabrics, with built in UPF sun protection, engineered ventilation and Insect Shield technology that repels bugs. Choose long sleeve Wayfarer plaid shirts, Therma-Wool tops, hiking and travel pants, and Badwater shorts or practical Too Tough Trunks. Every guy who loves the outdoors will need a collection of Jammin' shorts, as well, perfectly cut for journeying close or across the world. Women's Collection - Find great style and practicality rolled into one with the fashion-inspired outdoor clothing for women from the smartly engineered apparel collection. Whether you are strolling through the city, traveling, or tackling an outdoor adventure, the fashions here were designed for you. Flattering and smart, the lightweight, comfortable fabrics of the shirts, capris, zip up hoodies and walking shorts will keep you dry, comfortable and ready to do more miles. 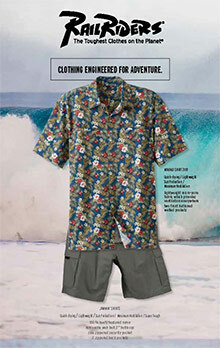 Adventure Accessories and Gear - Suiting up for your next big adventure doesn't stop with the right pair of cargo pants. They have channel air socks for hiking, trekking, mountaineering and backpacking comfort, as well as windshirts, camping tool mesh belts, wilderness guides, carabiners, mess kits and travel accessories. RailRiders catalog attractive outdoor theme jewelry is perfect men and women, and makes a great outdoor enthusiast gift, too. You will even find the best sun sombrero online right here. Innovative High Performance Fabrics - Their clothing is designed to make the most of lightweight but rugged fabrics, like Versatac rip-stop nylon, anti-microbial and super wicking Sun-Guard, and Insect Shield Repellent products. . Design features include reinforced seats, elastic where you need it for easy fit, vertical zippers for access, Velcro and double button closures. With the RailRiders coupon code, you can stock up on action engineered clothing for all your adventures. Get ready for your next adventure with clothing that is built to keep you comfortable, dry and performing at your best - all while looking good. From the mountains to the islands, RailRiders.com has outdoor apparel that is engineered for active men and women.